For the purposes of subsection 12(1) of the Act, the spouse or common-law partner in Canada class is hereby prescribed as a class of persons who may become permanent residents on the basis of the requirements of this Division. are the subject of a sponsorship application. subject to subsection (2), the sponsor previously made an application for permanent residence and became a permanent resident and, at the time of that application, the foreign national was a non-accompanying family member of the sponsor and was not examined. Subject to subsection (3), paragraph (1)(d) does not apply in respect of a foreign national referred to in that paragraph who was not examined because an officer determined that they were not required by the Act or the former Act, as applicable, to be examined. the foreign national was the sponsor’s spouse, was living separate and apart from the sponsor and was not examined. In subsection (2), former Act has the same meaning as in section 187 of the Act. A decision shall not be made on an application for permanent residence by a foreign national as a member of the spouse or common-law partner in Canada class if the sponsor withdraws their sponsorship application in respect of that foreign national. For the purposes of Part 5, a foreign national who makes an application as a member of the spouse or common-law partner in Canada class and their accompanying family members shall not become a permanent resident unless a sponsorship undertaking in respect of the foreign national and those family members is in effect and the sponsor who gave that undertaking still meets the requirements of section 133 and, if applicable, section 137.
at the time it is made, the application includes a request for the family member to remain in Canada as a permanent resident. the family member is not inadmissible. A sponsor who is a Canadian citizen and does not reside in Canada may sponsor a foreign national who makes an application referred to in subsection (1) and is the sponsor’s spouse, common-law partner, conjugal partner or dependent child who has no dependent children, if the sponsor will reside in Canada when the foreign national becomes a permanent resident. A sponsor who became a permanent resident or a Canadian citizen after being sponsored as a spouse, common-law partner or conjugal partner under subsection 13(1) of the Act may not sponsor a foreign national referred to in subsection (1) as a spouse, common-law partner or conjugal partner, unless the sponsor has been a permanent resident, or a Canadian citizen, or a combination of the two, for a period of at least five years immediately preceding the day on which a sponsorship application referred to in paragraph (1)(c) is filed by the sponsor in respect of the foreign national. You can apply under the Spouse or Common-Law Partner in Canada class if your spouse or common-law partner cohabits (lives) with you in Canada and has temporary resident status. Your spouse or common-law partner can’t become a permanent resident in Canada if they’re inadmissible for any reason other than not having legal immigration status in Canada. A public policy also covers spouses and common-law partners who will be assessed for permanent residence even if they have no legal immigration status in Canada. Before applying, your spouse or common-law partner in Canada must resolve any other situation that made them inadmissible. Your spouse or partner may be eligible for an open work permit. For more information, see the section about Working and studying for spouses and partners below. Important information: if your spouse or partner is already working or studying in Canada and would like to continue, they must apply for an extension before their work or study permit expires. Leaving Canada can automatically cancel temporary resident status as a visitor, student or worker. If your spouse or common-law partner leaves Canada before becoming a permanent resident, they may not be allowed to come back. This is especially true if they need a Temporary Resident Visa or an eTA to enter Canada. If your spouse or partner can’t return to Canada, you must submit a new overseas sponsorship application. If your spouse or common-law partner already has a work or study permit, he or she may continue to work or study as long as the permit is valid. It is illegal to work or study without authorization from IRCC. Can my spouse or partner work in Canada? If your spouse or common-law partner already has a work permit, he or she may continue to work as long as the permit is valid. If your spouse or common-law partner is living in Canada with you and is applying as a member of the Spouse or Common-Law Partner in Canada class, they can also apply for an open work permit when they apply for permanent residence. They must include a completed Application to Change Conditions, Extend my Stay or Remain in Canada as a Worker form [IMM 5710] (PDF, 484.21KB) and the correct fee, explaining that they are applying for an open work permit. For more instructions, see the guide for Applying to Change Conditions or Extend Your Stay in Canada. See the Help Centre for information about Open work permits for spouses and partners. Note: If you’re applying under the Spouse or Common-Law Partner in Canada class and you’ve submitted an application for an open work permit, your work permit will normally be processed within four months. Can my spouse or partner study in Canada? If your spouse or common-law partner already has a study permit and wants to keep their temporary resident status as a student, they may submit an Application to Change Conditions, Extend my Stay or Remain in Canada as a Student form [IMM 5709] (PDF, 488.83KB). See the guide for more instructions. Otherwise, we will advise your spouse or common-law partner in writing when they’re eligible to apply for a study permit. Dependants must continue to meet these requirements until they enter Canada as a permanent resident. If we received your permanent residence application on or before October 23, 2017, a previous definition of dependent children may apply. Important: If the person you are sponsoring (or their child) has one or more children in the sole custody of their other parent, you must still declare the child in the application. Even if there’s a written agreement or court order to show that the sponsored person doesn’t have custody or responsibility, you must list the child on the application and this child must do a medical exam. Doing this gives the sponsored person the possibility to sponsor their child as a member of the family class in the future, when there may be changes to the custody or living arrangements. If a permanent resident doesn’t declare all their family members on their application, they could risk losing their permanent resident status. The person you’re sponsoring has a child in the sole custody of a previous spouse. Do they need to include this child in their application? Yes. Children in the custody of a previous spouse or partner are considered dependent children. Even if there’s a written agreement or court order to show that the sponsored person doesn’t have custody or responsibility, you must list the child on the application and this child must do a medical exam. Doing this gives the sponsored person the possibility to sponsor their child as a member of the family class in the future, when there may be changes to the custody or living arrangements. Also, if a permanent resident doesn’t declare all their family members on their application, they could risk losing their permanent resident status. Note: This is only a guide. A Canadian immigration officer will decide if you can enter Canada when you apply for a visa, an Electronic Travel Authorization (eTA), or when you arrive at a port of entry. Get your application package, including your checklist, forms and instructions. links you to instructions to fill out each form. You must print, fill out and submit a copy of this checklist with your application. Place it at the top, as the cover of your application. Important: if you don’t include all the requested forms and documents listed on the checklist, we will return your application without processing it. If you’re unable to submit an item on the document checklist, you must include a detailed explanation of why you can’t submit this document so that your application is not returned as incomplete. For each item on the checklist, choose the situation that applies to you and check the correct box. Only submit documents that apply to your specific situation. We’ll contact you if we need more information. An affidavit from the person who completed the translation. See Translation of documents below. We’ll return applications with missing, incomplete, or unsigned forms. If there are one or more sections of your checklist which do not apply to you, write N/A or Not Applicable in the margins of each of these sections on your checklist. Check the country-specific requirements to see if you need to submit any original documents. If the country specific requirements tell you that you must submit an original document instead of a copy, you must submit the original or we will return your application. See below for more information about country specific requirements. You’ll find your country specific requirements on the family sponsorship application kit webpage. Checking your country specific requirements will help make sure you send the correct documents for each item on the checklist and will increase the chance that your application will be accepted for processing. To see additional forms or documents required for the person being sponsored (principal applicant) and their family members, select the country where they reside. You may need to follow special instructions about specific documents based on the country you’ll get the documents from. For example, there are specific requirements for civil documents from different countries (e.g. birth certificates, other proof of identity, child custody documentation, family booklets, etc.). To see instructions about specific documents, select the country where the document is issued. For example, if you are living in the United States but you are submitting a birth certificate issued in the Philippines, check the requirements for “Philippines” to make sure the document you are submitting is the right one. Note: your application will be returned if any of the requested documents are missing (see section 10 of the Immigration and Refugee Protection Regulations (IRPR) for more information). Make sure all photocopies are clear and easy to read. Other than copies of original documents used for translations, photocopies do not need to be certified. Don’t send originals unless we ask for them, because they will not be returned. Important information: While processing your application, we may ask for more documents and there may be delays if you don’t submit them. Should you fail to respond by the deadline given, your application could be refused for not complying with an officer’s request. Current country of residence if you (or they) have lived there for six months or more. The country where you (or they) resided for most of your (or their) life since the age of 18. Note: Some countries need a consent form from IRCC to issue a police certificate. Find out if any person included on the application needs a police certificate requires a consent form. If any country requires a consent form from IRCC to issue a police certificate, the consent form should be submitted to us in place of the police certificate. Once received, we’ll assess the consent form and start the police certificate request. Important: If required police certificates (or consent forms if applicable) can’t be submitted with your application, a detailed explanation must be provided explaining why these are not being provided. This will likely delay the processing of your application. See How to get a police certificate for up-to-date information about obtaining police certificate from any country. If your application is approved, we’ll use the photos you include in your application package to create a Permanent Resident Card for you (and your family members, if applicable). To avoid delays in getting your Confirmation of Permanent Resident document (which you’ll need to travel to Canada or become a permanent resident from within Canada), and/or your permanent resident card, it’s important that the photos meet certain specifications. See Appendix C for photo specifications. Translations may be done by a person who is fluent in both languages (English or French and the unofficial language). If the translation isn’t done by a member in good standing of a provincial or territorial organization of translators and interpreters in Canada, you must submit an affidavit swearing to the accuracy of the translation and the language proficiency of the translator. A certified translator will provide both a certified translation and certified copies of the original documents. Important information: Translations must not be done by the applicants themselves nor by members of the applicant’s family. This includes a parent, guardian, sibling, spouse, common-law partner, conjugal partner, grandparent, child, aunt, uncle, niece, nephew and first cousin. Note: An affidavit is a document on which the translator has sworn, in the presence of a person authorized to administer oaths in the country where the translator is living, that the contents of their translation are a true translation and representation of the contents of the original document. Translators who are certified in Canada don’t need to supply an affidavit. Authority to certify varies by province and territory. Check with your local provincial or territorial authorities. Authority to certify international documents varies by country. Check with your local authorities. Applicants themselves or members of their family may not certify copies of your documents. This includes a parent, guardian, sibling, spouse, common-law partner, conjugal partner, grandparent, child, aunt, uncle, niece, nephew and first cousin. Use your checklist to prepare the forms. The last page of your checklist includes a list of all signatures that are required for each person included on the application. If any requested forms are not fully completed and signed (if applicable), or not included in the application package, your application will not be accepted for processing and will be returned to you. Note: If you are less than 18 years of age, your form(s) must be signed by one of your parents or a legal guardian. Note: Need help with a PDF document? Get help to open an application form. You can also get help to complete an application form. If you’re having technical problems with a PDF document, see the Help Centre for common problems with form validation. Important information: It is a serious offence to give false or misleading information on these forms. The information on your application may be verified. Financial Evaluation [IMM 1283] (PDF, 1.24MB), only if you are sponsoring a dependent child who has their own dependent child. Unless instructed otherwise, sponsors in Quebec do not need to fill this out. Use of a Representative (IMM 5476) (PDF, 648.31KB), if using a representative. Schedule A – Background/Declaration [IMM 5669] (PDF, 434.14KB), required for all principal applicants, and all dependants 18 years of age or older. Use of a Representative (IMM 5476), if using a representative. If you’re applying for permanent residence in Canada, you must declare all of your family members. There are no exceptions to this requirement. In addition, all family members must be examined as part of the process of applying for permanent residence in Canada, even if they will not come to Canada with the principal applicant. Family members who aren’t declared and examined are excluded from the family class, which means you can’t sponsor them at a later date. If a permanent resident doesn’t declare all their family members on their application, they could risk losing their permanent resident status. Find more information about why you must declare all family members. You should fill out your forms on a computer and validate them electronically to make sure you’ve answered all questions. This reduces mistakes and helps you submit a form that is complete. When you click on the Validate button, any missing information will be identified by a pop-up error message or a red square around the fields that need to be completed. Important: If you are unable to fill out your forms using a computer or are unable to successfully validate your forms, you must provide a written explanation for why you were unable to do so. 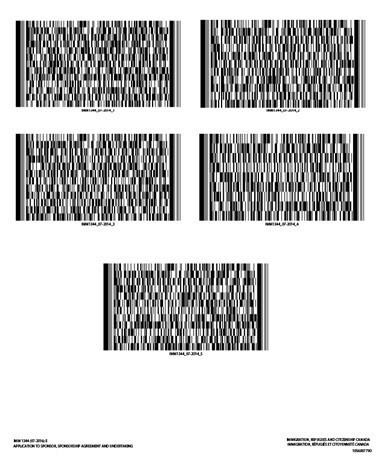 After being validated, the IMM 1344 and IMM 0008 will create barcode pages (see image below). When you’re preparing your application, place these barcode pages right underneath your checklist. Note:The IMM 5669 (Schedule A) form will not produce a barcode page when it’s validated. After clicking the validate button, nothing happens and I don’t see barcodes. Note: The Help Centre information about viewing PDF documents applies to all PDF documents. After you validate the forms to generate barcodes, print the form. Then, the applicable client must sign the form in ink. Unsigned forms will not be accepted. Fill out all sections. If a section doesn’t apply to you, write “N/A” (or “not applicable”) next to the appropriate section. If your application is incomplete it may be returned to you (see section 10 of the IRPR for more information) and this will delay processing. If you need more space for any section, use a separate sheet of paper. Make sure you label this sheet with your name and the question you are answering. Use the following instructions to fill out the forms. Most of the questions on the forms are straightforward and extra instructions have only been given for some questions. You must answer all questions. in the Sponsor your spouse, common-law partner, conjugal partner or dependent child – Complete Guide (IMM 5289) :Additional Family Information (IMM 5406)Who needs to fill out this form? All dependent children aged 18 or over (whether coming with you to Canada or not). Note: if your dependent child is the principal applicant on a sponsorship application, you should complete this form on their behalf regardless of their age.accordingly, the principal applicant, and all dependent children must fill the form. then who are qualified as the dependent children? · then on the IMM 5533(document checklist spouse (including dependent children) sct 8: additional family information (IMM) which stipulate that : the following persons must fill out their own copy of this form: you (the principal applicant), and any of your family members 18 years of age or older( who are not already Canadian citizens or permanent residents). Again in the form of IMM 5604 additional family information, the requirement is : the principal applicant, their spouse or common-law partner(if applicable),and all dependent children 18 years of age or older must complete their own copy of this form. · (c) a dependent child of adependent child referred to in paragraph (b). thus: who must fill the form of IMM 5406 there are a different description in various law and regulation and definition. although the principal applicant and the dependent children are same requirements, while the spouse and family member only appear on the complete guild and the document checklist. as the result, it must cause confusion for those who need fill the forms. the dependents children only including any child under 22 years of age, while family member will including the spouse of the principal applicant. 36 (1)Subject to the regulations, on payment of the premium assessed for a certificate, and on approval of the application by the corporation, the corporation must issue the certificate to the applicant. (b)to adequately identify the permit or licence under the Motor Vehicle Act or Commercial Transport Act, or a motor vehicle or trailer or driver's licence, permit or other authority to drive a motor vehicle under the Motor Vehicle Act to which the owner's certificate or the driver's certificate corresponds. (3)The corporation must provide for the issue and delivery of all motor vehicle liability insurance cards required under the Motor Vehicle Act by a person insured under a certificate but there may be printed on a certificate under the heading "Motor Vehicle Liability Insurance Card" particulars established by the corporation for motor vehicle liability insurance cards that are required under the Motor Vehicle Act, and the particulars so printed constitute a motor vehicle liability insurance card under and for the purpose of the Motor Vehicle Act. (4)A document purporting to be a certificate under this Act and a motor vehicle liability insurance card, or either of them, either alone or in combination with any permit or licence for a motor vehicle or trailer or their use or operation, or any driver's licence, permit or other authority to drive a motor vehicle that bears a signature purporting to be the signature of the general manager of the corporation, unless the contrary is shown, is deemed to be a certificate or a motor vehicle liability insurance card, as applicable, issued under this Act to the person named in it. (5)A motor vehicle liability insurance card must not be issued unless the insurance evidenced in it meets the minimum requirements for a certificate. 38 (1)Except for a vehicle exempted by the regulations, a permit of any kind and a licence, number plate or decal for a vehicle or for its use or operation must not be granted, issued or renewed under the Motor Vehicle Act or the Commercial Transport Act, unless at or before the time of application the applicant has applied to the corporation or its agent for and is entitled to a certificate other than a driver's certificate under this Act in respect of the vehicle for the term of the permit or licence, or part of that term as may be prescribed, and the applicant has paid the premium for the certificate. (b)the applicant has paid the premium established for that driver's certificate. (a)the premium or fee prescribed for the transfer. (2)Despite the date of issue, a driver's certificate, unless earlier suspended, revoked, cancelled or surrendered, expires at the end of the day on the anniversary date of the driver's birth. (3)For the purposes of subsection (2), the anniversary date of a person born on February 29, in other than leap years, is deemed to be March 1. (4)Subject to the regulations, the applicant must, on application for renewal or replacement of a certificate, pay the corporation or its agent the premium established and assessed by the corporation for the applicable certificate. (5)If a certificate other than a driver's certificate in respect of a vehicle is not, before its expiration, renewed or replaced by another certificate for the same vehicle, a permit or licence for that vehicle or its use or operation issued under the Motor Vehicle Act or Commercial Transport Act that corresponds to the certificate, on the expiry of the certificate and without further act or notice from the corporation, is suspended, invalid and of no effect until it is renewed, replaced, reinstated or validated following application for, payment of the premium for and issue of the appropriate certificate. (6)If a driver's certificate is not, before its expiration, renewed or replaced by another driver's certificate for the same person, the driver's licence, permit or other authority to drive under the Motor Vehicle Act of the driver and that corresponds to the certificate, by virtue of and from the time of the default, without further act or notice from the corporation, is suspended, invalid and of no effect until it is renewed, replaced, reinstated or validated following application for, payment of the premium for and issue of the appropriate driver's certificate. (c)pay costs, expenses, interest and reimbursement that are prescribed by the regulations. (c)the insured makes a wilfully false statement with respect to the claim. 85 (1)An insurer may for a particular case waive a term or condition of the plan or an optional insurance contract. (2)A term or condition of the plan or an optional insurance contract is not waived by the insurer in whole or in part unless the waiver is in writing and signed by a person authorized for that purpose by the insurer. (3)Neither the insurer nor the insured waives any term or condition of the plan or an optional insurance contract by any act relating to the appraisal of the amount of loss or to the delivery and completion of proofs or to the investigation or adjustment of any claim under the plan or an optional insurance contract. (b)constitutes, to the extent of the payment, a release by the person or his or her personal representative of any claim that the person or the personal representative or any person claiming through or under him or her, or by virtue of the Family Compensation Act, may have against the insured and the insurer. (2)Nothing in this section precludes an insurer making the payment from demanding, as a condition precedent to the payment, a release from the person, or his or her personal representative, or any other person, to the extent of that payment. (3)If a person commences an action, the fact of any payment referred to in subsection (1) must not be disclosed to the court or to the jury, and the court must adjudicate on the matter without reference to any payment referred to in that subsection but, after awarding damages and costs, if any, the payment must be disclosed and must be taken into account and the person is only entitled to judgment to be entered for the net amount, if any. GMT-5, 4/19/2019 02:15 , Processed in 1.271379 second(s), 13 queries , Gzip On.